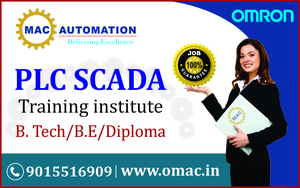 Join Omac Automation, the "Best Automation Training Institute" and get great Placement opportunity. We also deliver Corporate training, live project with free workshop. There will be multiple openings of your future scope in plc/scada & Job monitor by our experienced faculties. Call us at 9015516909 to get free demo classes and also for group discount.